BEEN THERE (close): I drove by while visiting an old friend in Washington state in the summer of 1987. After the ignominious failure of the Seattle Pilots baseball franchise (1969), civic leaders in Seattle redoubled their push to build an all-weather multisport facility. Baseball simply could not survive in the rainy Pacific Northwest without a roof of some sort, and as in the case of Cincinnati, the only way to get a new stadiium built with public financing was to create a new NFL franchise -- hence the Seahawks. After years of delays and at a total cost of $67 million, the Kingdome was completed in time for the 1976 football season. It was the third large domed multi-sport stadium, built eleven years after the Astrodome and one year after the Louisiana Superdome. It served as a model for three other such stadiums built over the next twelve years in northern cities: Montreal, Minneapolis, and Toronto. The Kingdome was the tenth of the circular "cookie-cutter" / "doughnut clone" stadiums, but it was the first (and only) stadium to combine a circular outer perimeter with a (rounded) rectangular field shape. As a result, the depth of the upper deck varied considerably, like at Tropicana Field or at RFK Stadium, which differed in having a variable-height roof. Like the two "octorad" stadiums -- Jack Murphy Stadium and Veterans Stadium -- the football gridiron in the Kingdome was aligned parallel to the foul lines. The overall design was quite ill-suited for baseball, as the total outfield area was much less than normal, while the amount of foul territory was enormous, until the 1990s. Most fans needed binoculars, especially the ones in the upper decks. One curious distinctive feature of the Kingdome was that the vast majority of the third-deck seats, as well the first and second deck seats in left field were mere benches -- an economy move that cut back on comfort. The Kingdome's original outfield dimensions were perfectly symmetrical, and extremely short: only 315 feet to each foul pole, give or take a foot. (Measurements varied slightly.) To reduce the number of home runs, the inner fence in right field was removed in 1982, leaving a 23-foot high wall that provided a little more challenge for sluggers. In 1988 a six-foot high plexiglass shield was installed on top of the left field fence, following the example of the Metrodome in Minneapolis. It only stayed in use for two years, however. As the novelty of indoor baseball wore off and the crowds thinned during the 1980s, the Kingdome became known as "the Tomb," for its deathly gray color and haunting echo effects. According to Bob Wood (1988), the view from the back rows of the lower decks was severely constricted by the low clearance between decks. This was apparently an artifact of the dome structure: the massive weight of the concrete roof provided an added measure of cantilevered stress, making possible greater "overhang" between decks. Note that the luxury suites depicted in the lower-deck diagram above is conjectural, based on photographs alone. In hopes of regenerating fan interest, the Kingdome was renovated in 1990. The diamond was moved closer to the right side dugout, increasing the distance to left field was by ten feet; the distance was increased by seven more feet in 1991. The backstop distance thereby shrunk from 63 feet to about 53 feet. This made the outfield dimensions slightly more reasonable, but one wonders why they didn't just place home plate 15 or so feet further back in the original design. Hence the "hypothetical alternative" diagram above. That would have solved both the problems of scant outfield size and excessive foul territory; the backstop distance would have been about 47 feet. At some point (during the late 1980s?) both ends of the upper deck were extended toward the scoreboard overlooking left field, but the capacity figures do not reflect the four additional seating sections. In July 1994 several ceiling tiles fell onto the seats and it was a miracle somebody didn't get hurt. Repairs were made and improved acoustical ceiling tiles were installed while the Mariners went on an unscheduled road trip, at which point the players' strike cancelled the rest of the season. Repairs or not, everyone knew that this bleak white elephant's days were numbered. Sparked by the batting of Ken Griffey, Jr. and Alex Rodriguez, as well as the awesome pitching of Randy Johnson, in 1995 the Mariners made it to the postseason for the first time in their franchise history. They edged the California Angels in a one-game divisional playoff and then beat the the Yankees in the first round, but finally lost the American League pennant to the Cleveland Indians. Encouraged by the Mariners' winning ways, Seattle mustered the political will to fund new (separate) baseball and football stadiums, as the state legislature authorized $320 million in public financing in 1996. 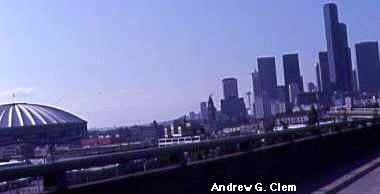 In July 1999 the Mariners abandoned the leaky old Kingdome and moved into Safeco Field, right next door. The Seattle Seahawks played football in the Kingdome from 1976 until the end of the 1999 season, briefly interrupted by the emergency repairs in September 1994. The seating capacity for football games was 66,000, and the reconfiguration was basically a matter of retracting a large section in right field, with a few minor shifts here and there. The Seahawks played for two seasons at the University of Washington's Husky Stadium, and 2002 they inaugurated Seahawks Stadium, located exactly where the Kingdome had previously stood. (See the "site today" diagram above; it was renamed "Qwest Field" in 2004 and "CenturyLink Field" in 2012.) As for other sports, the Seattle Sounders of the North American Soccer League played there from 1976 to 1983. Finally, the NBA Seattle SuperSonics played in the Kingdome from 1978 to 1985, one of only three NBA teams to share a home field with a major league baseball team. (The others were the Toronto Raptors and the Minnesota Timberwolves.) For basketball games, seating capacity was 40,000. (The precise method of reconfiguration is uncertain, hence the question mark.) There was still $127 million of outstanding debt on the Kingdome when it was demolished via implosion on March 26, 2000; the debt was finally paid off in March 2015. Have you been to this stadium? If so, feel free to share your impressions of it with other fans! (Registration is required.) Also, I welcome submissions of original stadium photos, and will make sure they get properly credited. Just send me an e-mail message via the Contact page.